This was a custom build for renowned Estonian blues guitarist Raul Ukareda. Raul has been playing with Tallinn-based Compromise Blue for 25 years, as well as participating in numerous other blues and other genre projects. Besides being a sterling guitar player, Raul does a lot of work supporting the local music scene, and we at Prophecysound have benefited from his assistance with our own musical endeavours. So we thought it would be a cool idea to give a little back with something he might find useful. To the pedal itself - we put together a Runoff Groove Thor and the classic Octavia design in the same pedal. If you aren't familiar with the Thor, you can check out the circuits details and some samples at the Runoff Groove site here. 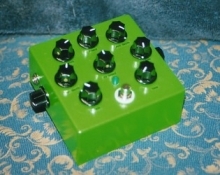 The Thor is a amp simulator with a sound similar to the Marshall Super Lead. The Octavia everyone knows - it's the octave / ring modulation / fuzz pedal made famous by Hendrix and many others. We elected to add a pre-gain control to this Octavia build for extra control. Like some other Thor builders, we found that the bright switch, when engaged, made things a little too bright - a small tweak to the circuit made this switch produce much more usable results. 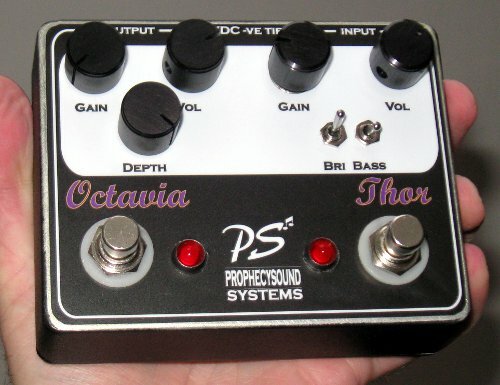 With both effects turned on, the Thor feeding the Octavia, sonic mayhem of chainsaw-through-speaker dimensions results. Please note - all credit for the Thor circuit belongs to the Runoff Groove guys.